March 16th was the 5 year anniversary of my Blog. I usually post exactly on that day but this time I'm throwing in a huge finish that's worth the wait. "Reflections" is a bit tardy so that makes it all seem intentional with a touch of serendipity mixed in for good measure. Blocks made by BeeSewcial mates Stephanie, Leanne, Melissa, Diane, Hilary, Marci, Felicity, Kari and Debbie for the July 2015 "Reflections" challenge has finally become a finished quilt. Thrilled is an understatement and the inspiration palette in the background made for a fun shoot. Because of the recent storm, there are many more props to use on the beach. My instructions to them were "your block does not HAVE to be literal, but it CAN be. It's as much about the relationship of colors and/or shapes within the block. A change of value or scale from top to bottom or side to side. An exaggeration or distortion that the word Reflection evokes. The transition doesn't have to be in the middle or a hard horizon but there should be some design element that varies within the composition." 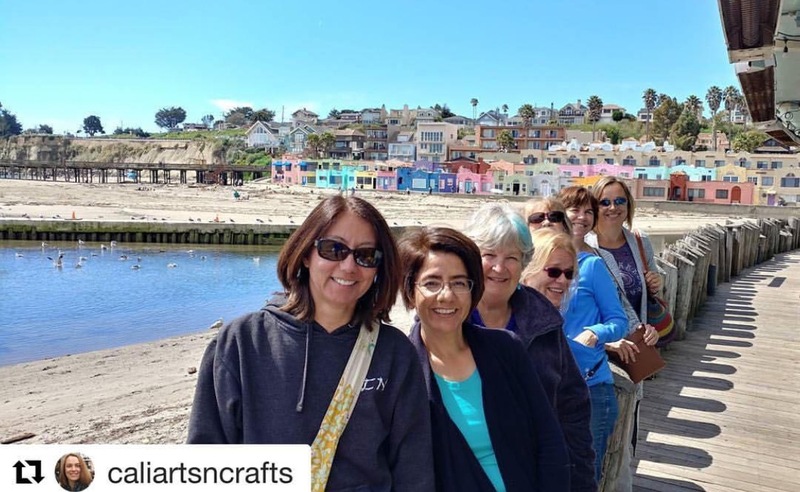 During a member spark week of QDAD, I took this photo of the Venetian's in Capitola Village for the inspiration. It was a favorite and yet the designs I came up with fells short. 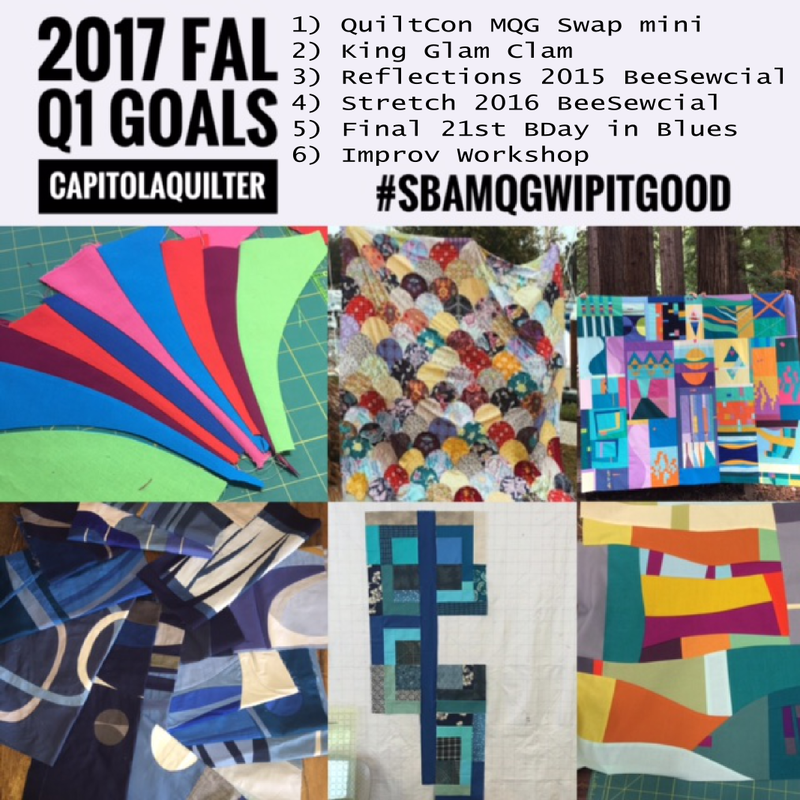 Fortunately, the concept and palette found a successful place in my creative journey when it was time for me to be queen July 2015 with the BeeSewcial challenge. Can you blame me for freaking out a little about sewing these together? They are each an individual work of art. This is an early version of the block placement at one stage of the process. Pretty much the entire four day retreat in October was devoted solely to getting it right and every night I would stay up late convinced that it was ready to roll the next morning only to wake up and change my mind. Even knowing there is no one right answer to the puzzling question, it was difficult to commit. One move would domino a series of other moves. My guild mates marveled curiously at my flighty obsessiveness I am sure. It's no secret that Pat Bravo is an all-time favorite designer of mine. Isn't this fabric from her Sugar line the sweetest backing? Every time I repositioned while putting the face binding on I'd get a peak at the front and get all giddy about how well it complimented the colors. There was exactly enough yardage in my stash to fussy join the print at the seam too. My friend Pat generously lets me use her Handi Quilter Avante to quilt with. I went with a random-ish pattern that has sort of become my signature quilting. With so much going on in the quilt, an overall seemed appropriate. My go to color of Glide thread in Celery was a no brainer with the range of lights and darks. Bamboo batting for the win. She also has the most gorgeous hardwood floor and a stairs that allow me to take flattering photos from above with ease. The lighting exaggerates the texture which can be fun but terrifyingly revealing at the same time. 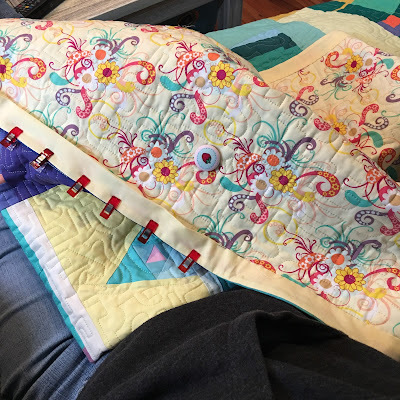 It was the perfect project to finish during this weekend's "Sew and Stroll" mini-retreat because I could sit and visit while hand stitching and then take advantage of all the hands to hold up the quilt later for the shoot. This group picture was taken by the nicest stranger who interrupted his slice of pizza to offer and help when he saw me struggling to extend my arm out for selfie. That one was worth a good laugh but nothing I'd ever share! The FAL Q1 is coming to an end and it thrills me to no end to have a second quilt that I can call finished. Our MQG challenge to complete WIPs runs longer so there's still hope for checking more off that list. 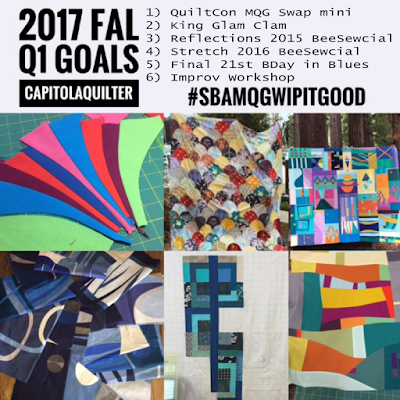 Now on to making a quilt from my BeeSewcial Stretch blocks from 2016 and the most recent set of EYES for 2017. Stay tuned. After much procrastination and fear that I wouldn't be able to do them justice, I'm on a roll. I think you did a wonderful job of putting all of those blocks together. I'm sure I would have changed my mind many times too. It is a beautiful quilt! oh it does my heart good to see your beautiful, finished quilt. I'm just so smitten with this combination of blocks and color, and photographed with the 'reflection' is just over the top. CONGRATULATIONS!! This is such a lovely, and I'm sure satisfying, finish. I am completely in awe of how you put those great blocks together to make this gorgeous quilt. The colors are amazing! It's beautiful. Keep rolling. Love everything about this. Thank you for sharing. I love little bits of me all over the place. 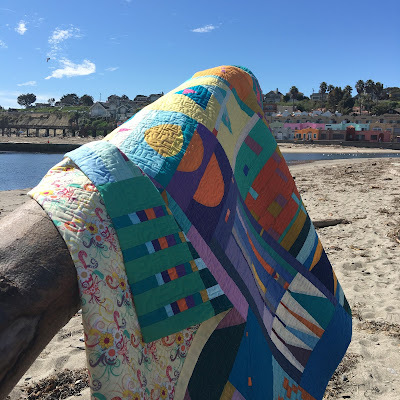 Such a deliciously satisfying post to read, full of all the best things: interesting landscapes, inspiration, brilliantly crafted Bee blocks, as well a genius of a quilt in the end. I think the combination of the aforementioned coupled with good friends and interesting quilting really makes this a most delightful read. Congratulations on a beautiful quilt!! Sometimes it just takes time for the 'perfect' form of something to reveal itself. 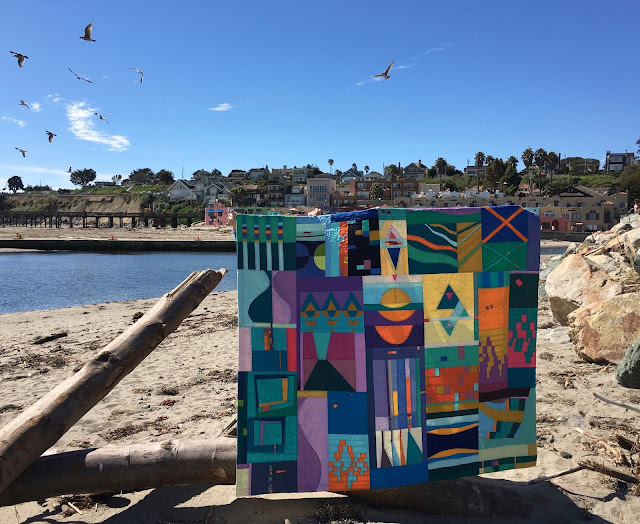 What a gorgeous quilt, and so fun to see that lovely background setting, too. Fantastic finish! What a fun group project! 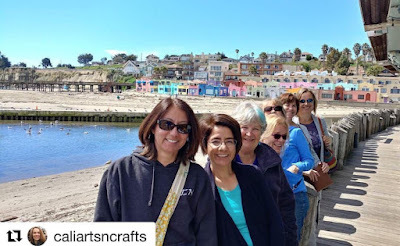 And I love all your Capitola beach shots! Very pretty! Congrates! Beautiful quilt Karen! And your location for capturing it is inspired! Awesome all 'round! 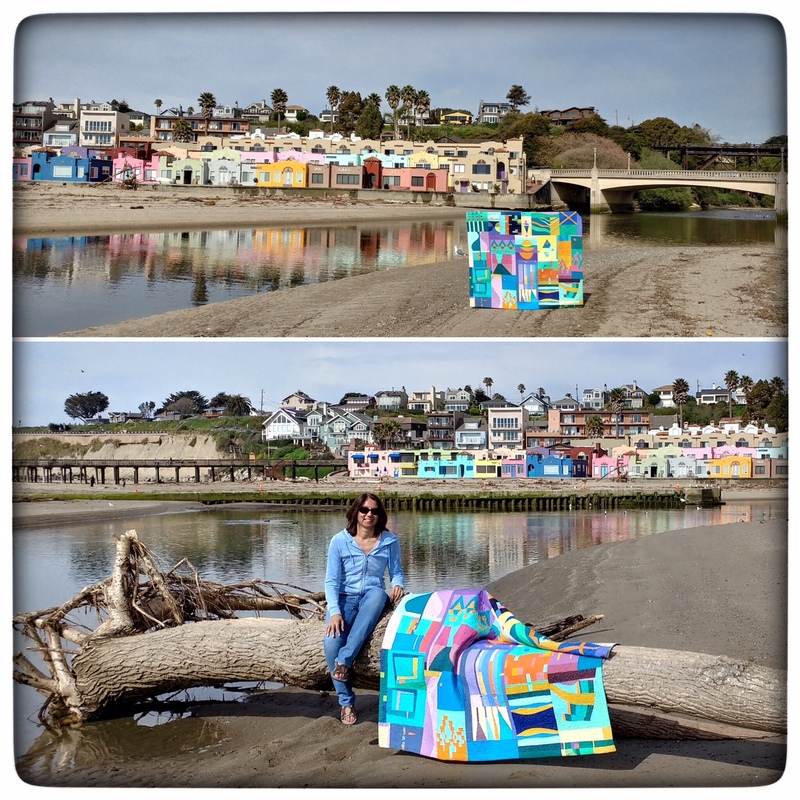 What a great quilt and great photo shoot. 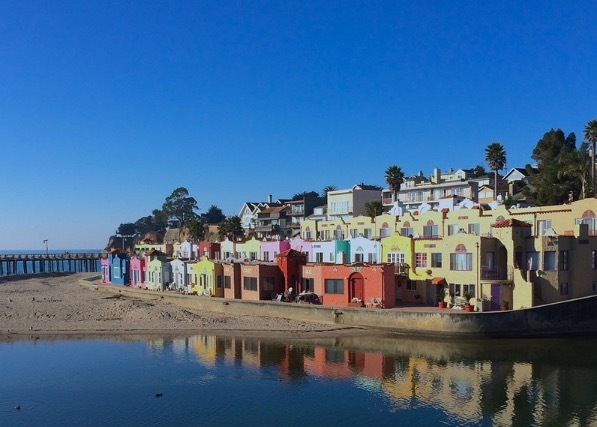 We've just looked up Capitola Village to find out more about it! 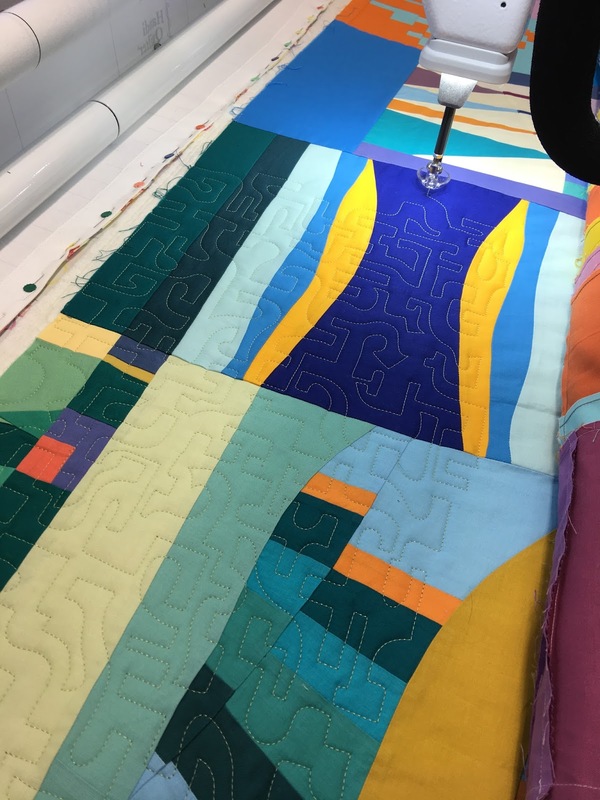 I have really enjoyed getting to know you and some of the Bee Sewcial gang and see these amazing quilts being made. This is just fantastic! Oh my, congratulations on this lovely finish! So impressed with the creativity of each contributor. Fantastic pictures! This is such a gorgeous finish! I love each block and the pictures - wow!! 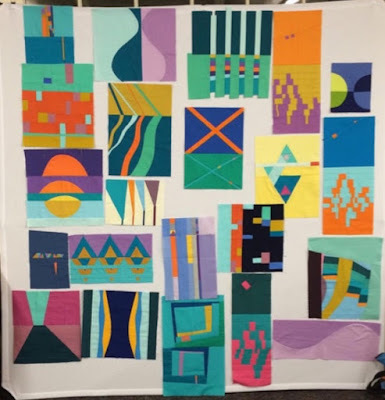 I am in awe of the creativity of each member and I am thrilled every time i see a finished quilt from members of the bee. Oh Karen, I just adore this quilt! I love knowing the back story to it, and seeing the inspirational area in which you live. It's just wonderful! I find it fascinating that you can CREATE when you're on a quilt retreat. To me, designing/putting together on the fly like that is impossible in a group situation. It takes focus, which you apparently can achieve while others are around you. Thanks for providing details about the quilt - batting and thread. I haven't used bamboo yet, but have a little stash of Glide threads to try... and haven't yet. The quilting you're doing is just right, not only because you can do it yourself on a longarm, but you can make the quilting minimal, as it should be on a quilt design like this. You're just so darned talented! Thanks for sharing all this in beautiful pictures. I love, love, love this... and that's love with a capital L! What a fantastic color palette!?! It was worth waiting for just the right photo day... perfectly fitting backing for a perfectly improv piece. Congrats on your FAL finish! Well you certainly did these blocks justice Karen! It really turned out amazing and the photoshoot just puts the cherry on the top. Though I have to say I'm really fond of that after quilting texture shot, it is amazing. I'm not sure what to say besides....WOW!!!!! Simply stunning!!!! Thank you for participating in the FAL - on behalf of the 2017 Global FAL hosts. Wow ! 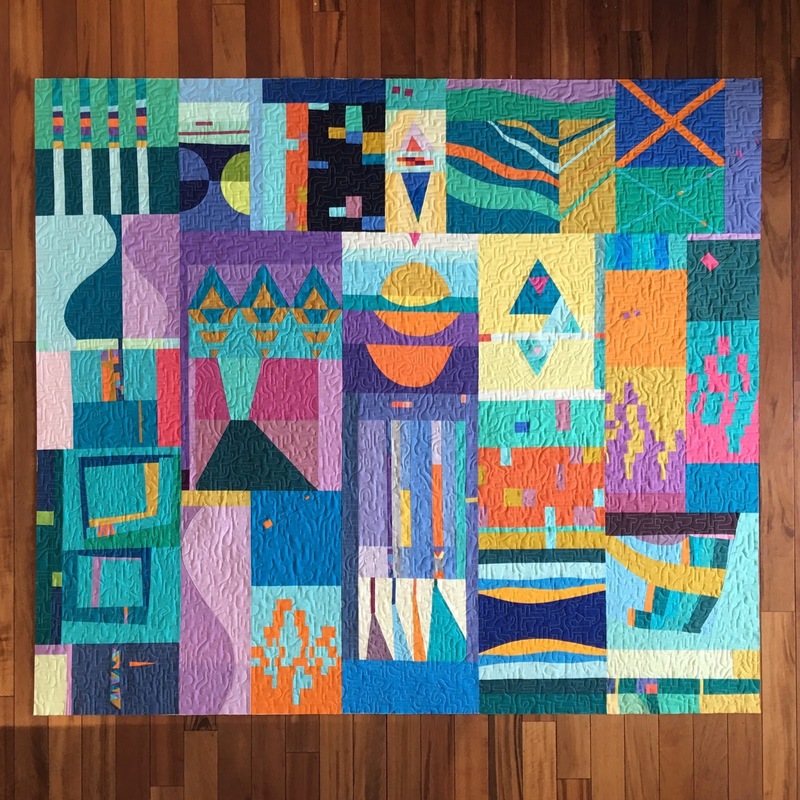 What an amazing quilt ! I love your photo shoot too.